SCRIPT: Newsbreak, I'm Brian Osuch. Understanding electrical safety is an important part of keeping your household free from danger… especially during the holidays. Kevin Yates of Siemens Low and Medium Voltage Division. CUT: (Yates) Make sure you inspect all of those lights and those decorations before you put them up. And make sure they're not cracked and don't have any frayed wires. SCRIPT: He also recommends checking your home's outlets and protecting them from the smallest of hands. CUT: (Yates) Childproofing is best served to use some of the latest technology on the market – like a tamper-resistant receptacle that actually prevents a child from putting some object into that outlet that can cause them a potential electrical shock. SCRIPT: And with cooler temperatures outside, you may consider using a space heater inside to warm things up. CUT: (Yates) Try – if possible – to plug that space heater directly into the outlet. Make sure you don't have any flammable material within three feet of that space heater. SCRIPT: For more information, go to USA.Siemens.com/WholeHouseSafety. 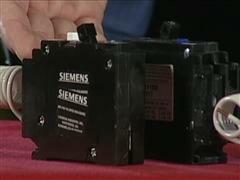 That's Newsbreak from Siemens. I'm Brian Osuch.